has looked to birds for inspiration. Creating beautiful objects with moulted feathers of otherwise repulsive birds, MccGwire's work questions the very nature of beauty. 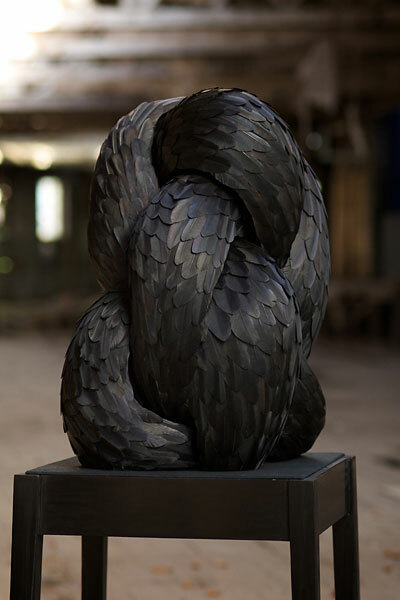 MccGwire's deliberate decision to use feathers of such birds like pigeon, duck, magpie, pheasant and crow is an attempt to have us rethink our preconceptions of beauty. "Pigeons are regarded as disgusting; they are thought of as rats with wings. But you've got a dove, which is the same species. They are exactly the same strain of bird - one is white and one is grey. The dove is the symbol of peace, purity and hope, and the pigeon is a rat with wings." She argues, "So we've put human characteristics against these birds that actually are quite contrary and don't make any sense at all." Beauty, for MccGwire is complex, sometimes discomfiting but always edifying. It can repel, pose a problem and make one question the status quo. The same goes for her work. 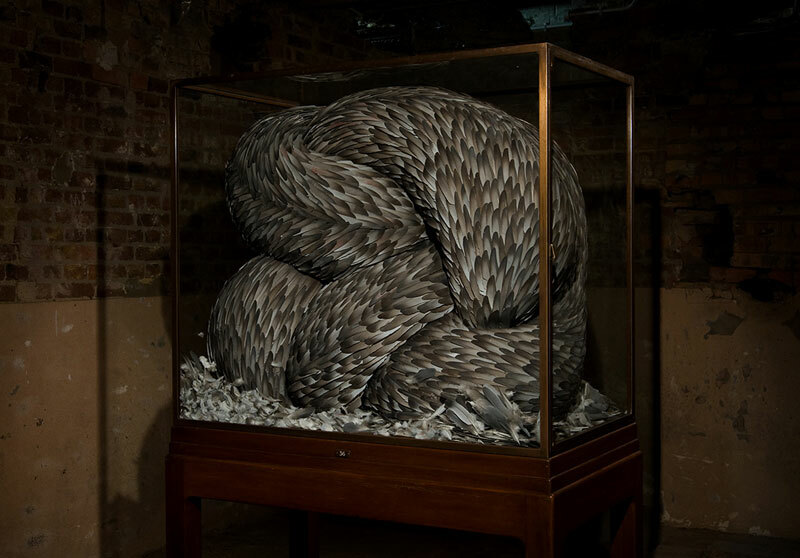 For instance, her cabinet works like Vice, Gag and Stifle look deceivingly ethereal and pretty only for the viewer to discover they've been made out of pigeon and crow feathers. It entices and then repels, making us reexamine our prejudices about what we deem beautiful. 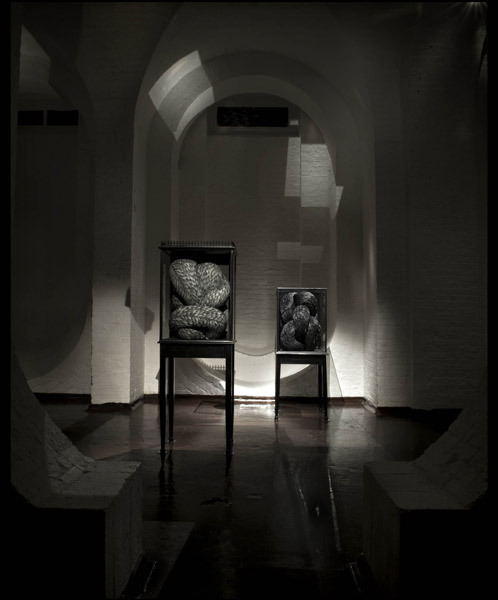 But even if the viewer is not aware what materials have been used for these pieces, there is still something intrinsically haunting and disquieting about MccGwire's work. Vex, for instance, has a surreal sort of beauty with its glossy black feathers. 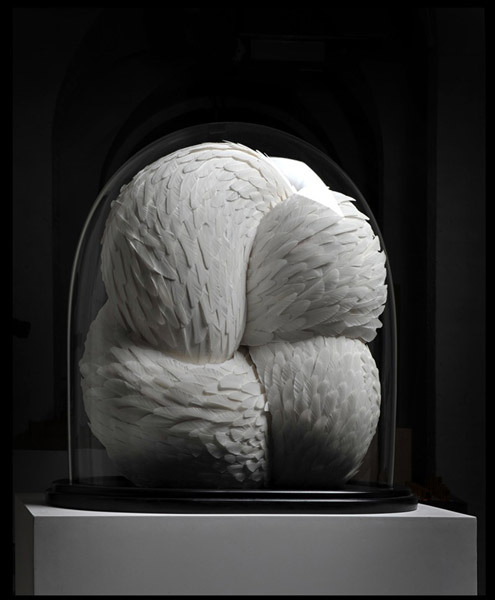 Such disturbing beauty encumbered in a glass case makes it even more unsettling, as if it's being held against its will, waiting to unfurl itself from its knotted position. While MccGwire's work is incredible in its finished form, the process of creating her installations is equally impressive. The construction of her work is intricate: abstract to the naked eye but with a definitive pattern (often spiral) on closer inspection. The material used often elicits disgust and repulsion while the delicacy of her work commands a certain amount of awe and wonder. 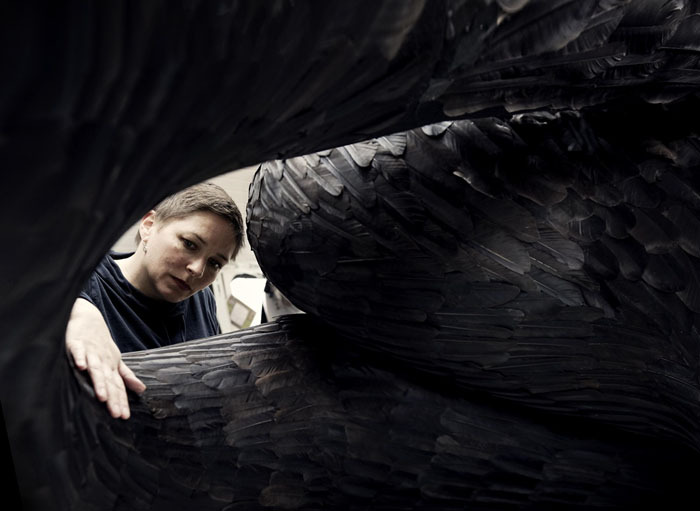 From 1 April to 30 April, MccGwire will be showcasing her new installation Corvid at the newly opened All Visual Arts in London, together with artist Alice Anderson. Here, MccGwire uses crow feathers for the second time, after her piece Vex. She explains, "For me, it is very important that the object that I use has an identity wherein people have a story attached to it already. A feather has mythology of its own. Some people might hate birds, be fearful of birds, and be attracted to birds. They have a whole bank of stuff associated with it, so I am constantly feeding on your known bank of knowledge." Can you tell us about how Charles Saatchi first discovered your work? I made my final degree show piece from chicken wishbones, and it was called Brood, and it contained twenty seven thousand wishbones. When I finished my course I thought well, I might as well make a really amazing piece because I will never have this amount of space to show again, and it was such a phenomenal change to showcase the work but I never really thought that it would be something that would remain. And it was made directly onto the wall, so it was not something that could be moved. Charles Saatchi came to the show the day after the opening, and I just happened to be in early that day, and he strolled in and that was really odd. It was a great experience and it was amazing to be installing in the Saatchi Gallery within three days of my graduation. I went from my graduation lunch with my parents to the Saatchi Gallery. That was an amazing experience and they were very proud. Have you changed your mind about crows and pigeons? I do look at crows and pigeons differently. I say thank you quite a lot. I was cutting up some wings the other day to make this new piece Corvid, and up in the trees, I heard this loud noise. It was a whole host of crows up there screaming. And I thought, "Oh, I know what I'm doing, I feel so guilty, cutting crow feathers." A tutor once said to me, not specifically to me about my work, that it is all very well to have a good idea but ideas change and develop and ferment whilst you are making. That's the only way to really explore. For me, certainly, as I am making one piece of work I'm constantly thinking, in a way fermenting the next piece of work that I am making. This meditative process that I go through whilst doing something takes a very long time. Some people might consider it very boring, but it is actually all part of the process for me to make another piece of work. He said to me, "Just make it. Just do what you want to do." Whereas, I think other artists are more conceptual in how they approach their work, and they do it all in their head before they even start. I design and create through making.